Heavy rain flooded hundreds of homes in Windsor, Ont., on the weekend as part of the same storm system that spawned a tornado in nearby Essex County also pummeled the border city. At least 1,400 homeowners reported water – and in some cases sewage – in their basements on Sunday. "You can definitely smell it," said Roy Amato, who still has bits of toilet paper on the rug in the basement of his Iroquois Street home in Walkerville. "I'm trying to keep all the doors closed and the windows open down here." Amanda and Dave Stewart need to wear rubber boots inside their east-end home. "When I came down this morning, there was maybe half a foot of water to a foot of water that I stepped into," said Amanda Stewart. "The cleanup is a disaster. I'm going to be waiting at least three, four days for a contractor. I'm 158th on their call list," Dave Stewart told CBC News. Cleaning companies were also flooded – with phone calls from desperate residents. "When you get a heavy flood like that, water always goes in the ground, which goes in the basement," said Paolo Pannunzio from Pannunzio Drainage. "You can't always stop the water from going in, but you can, 90 per cent of the time, do something about it." Pannunzio suggests checking sewer lines to ensure they aren't full of tree roots, and verifying sump pumps are working properly and the backup batteries are charged. He also recommends installing a backwater valve, so the city's untreated sewage does not find its way into your basement. Driving rain Saturday night overwhelmed the city's storm sewer system, but the city's engineer insists it was not an equipment failure that led to the flooding. "It was two inches [of rain] in a four-hour period recorded at the airport," said Mario Sonego. 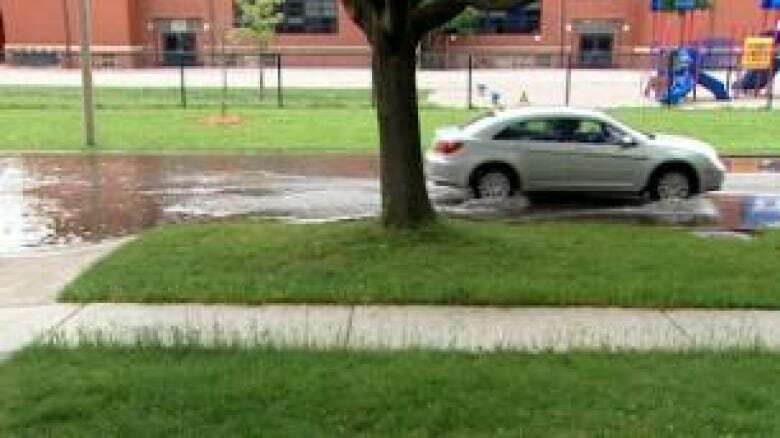 The City of Windsor said its storm sewers backed up late Saturday night, not due to equipment failure, but because they were overwhelmed by a heavy, sudden rainfall. ((Sandy Tymczak/CBC)) "It was 75 millimetres for the weekend. Probably more intense on the east side of town than that." The city is urging anyone who experienced flooding to call 311, so city crews can determine the problem area and find a way to make sure it doesn't happen again. In the meantime, the city will offer a special pickup Friday or Saturday for water-damaged items, at a cost to the municipality of approximately $20,000. Coun. Percy Hatfield said he'd spoken with several private homeowners, and felt they shouldn't have to foot the bill for private operators to haul away the damaged goods. "I was told it would cost maybe $1,000 to carry his flooded basement stuff away, and he had insurance, but it wasn't going to cover anything like that." Insurance problems presented an additional headache for many homeowners, who discovered their policies don't cover them for flood damage or cleanup. Insurance broker Esther Kafka said some neighbourhoods are considered high-risk, so it's harder to get flood of insurance there. "It's basically determined by a company's loss experience in a particular zone," said Kafka. "Once they find they have too many claims in a particular area code, typically what they can do is raise rates." Kafka said, in some cases, companies can cancel the insurance policy altogether. She suggests it's a good time for homeowners to review their policy to make sure they're covered for flooding and sewer backup.